No traces of the ash and I don’t smell like smoke. When God restores he takes away all the evidence. No bitterness or anger. We all know that marriages are under attack and people are walking away from their families everyday. 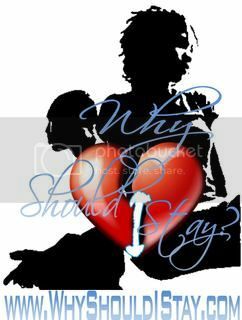 Husbands and wives are asking the question “Why Should I Stay?” each and everyday. I’ve said it ,my husband said it and if you are married ,you may have said it. When the question is asked, is there ever a response? Most times there is no response. Pride kicks in and no one wants to back down. This is a huge problem and we have decided to do something about it. “Why Should I Stay?” Marriage Seminar & Workshop will offer healing and transformational teachings to couples in your ministry or organization who are or have been in our shoes, as we were once that couple that was broken, almost irreconcilable. The enemy seeks to destroy the foundation, which is marriage. But we declare that he is a liar and a voice of hope must sweep this nation! Couples need to know that in spite of their situation and in spite of what it may look like at this time, there is HOPE! You can make it! No need for separation or divorce! You will make it! The? ? enemy comes to steak, kill and destroy and if we aren?? t on guard and prepared to fight he will be victorious.